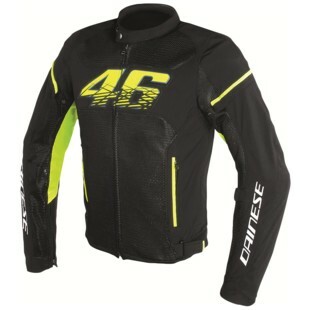 The new Dainese VR46 D1 Air Jacket is great for those looking to sport Rossi's numbers and signature colors. This looks to be a great addition for Dainese's 2017 summer lineup. The Dainese VR46 D1 Air Jacket is a mesh and textile sport jacket with removable composite protectors. The jacket also has a pocket for a back protector. The jacket also sports elastic along the wrists for a great fit. The jacket also features a removable windproof liner which is great for those chilly evenings. The jacket-trousers fastening system is also a great safety feature. This jacket seems to be a great answer to the very successful Rev'it! Airwave 2. This will be a great option for those Rossi fans looking for something cool in the summer but still want to keep that sport bike feel.